A team in more ways than one. 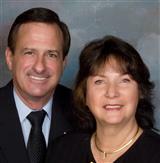 Don and Barbara have been together for over 40 years and now bring their varied backgrounds and experiences together to create for you a dynamic force to help you with your real estate needs. Remember, you don't sell your home - you sell your house and take your home with you to a new location. Let us help you. We are your Real Estate Resource. Serving all of your residential real estate needs. Whether you're buying a new house and/or selling one, first-time or seasoned buyer, relocating to or from this area, we can be your real estate resource. We'd love to work with you. We also specialize in St. Clair riverfront residential and condominium properties. Come out and boat with the big boys. You can live, work or vacation an hour from town and enjoy the ever-changing beauty of the Blue Water area.